Recently, the Portneuf Resource Council (PRC) hosted the Idaho Organization of Resource Councils Board of Directors in Pocatello. Along with the requirement to hold a quarterly meeting, the Board, and PRC friends, were treated to a tour of the Portneuf Valley and beyond to observe and discuss drinking water issues facing both the Pocatello and Chubbuck drinking water resources. 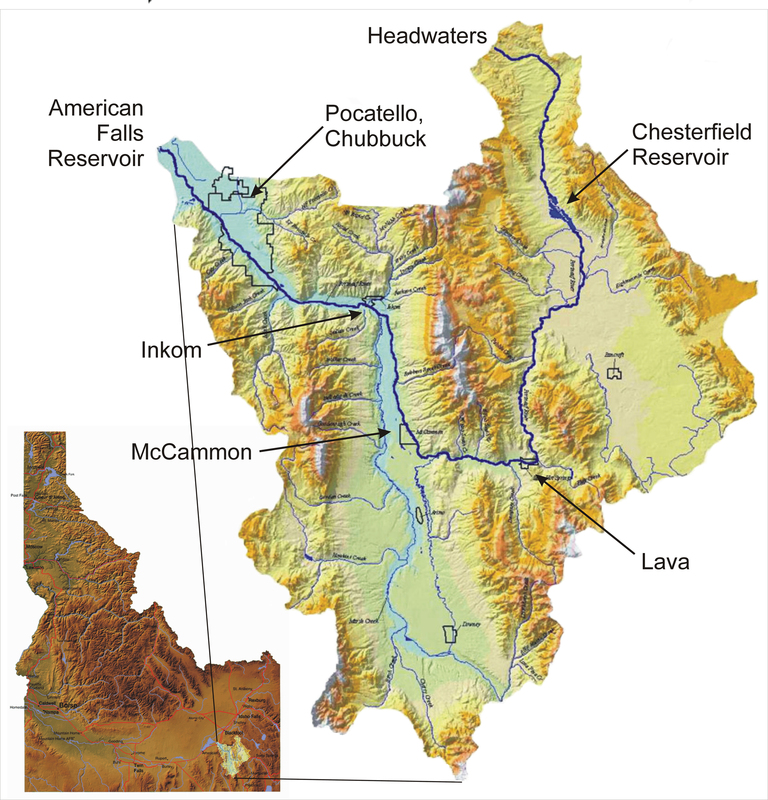 The Lower Portneuf Valley Aquifer is the only source of drinking water for Pocatello, Chubbuck, and north Bannock County. Because we live on top of the aquifer and because there is very little protective soil cover due to the geologic history of the valley, our water supply is vulnerable to contamination from human activities associated with industrial, business, residential, and agricultural practices. At the Highway Pond, south of Pocatello and just west of I-15, we observed ponded water in an old, partially reclaimed gravel pit. The water visible here, for the first time in many years, is part of the Lower Portneuf Valley Aquifer and is constantly moving through the pond from south to north. This is the drinking water for Pocatello and Chubbuck. This direct access to the aquifer makes it very vulnerable to contamination. To eliminate public and industrial access to these ponds, the Idaho Department of Transportation and the Department of Environmental Quality (DEQ) agreed to restrict all access to the pond and only allow it to be used as a place to discard clean fill materials in the hopes of eventually filling in this window to the aquifer. The city of Inkom is one of two towns within Bannock County whose sewage treatment effluent is discharged into the Portneuf River. Pocatello is the other town. EPA Region 10 in Seattle permits these discharges under the National Pollutant Discharge Elimination System program. For the most part, Pocatello’s wastewater discharge meets the requirements of their permit with EPA. However, Inkom has rarely met the requirements of their permit, logging over 400 permit violations. The Idaho Conservation League recently published a document that compiled the performances of all discharge permits in the State of Idaho. Inkom is the top violator. We observed that the Inkom waste treatment ponds are within the floodplain of the Portneuf River and due to this spring’s heavy precipitation and runoff, floodwaters almost overtopped the berms that form the effluent pond area. In addition, in order to cease all in-river discharges, Inkom is working toward construction of a land application area for treated effluent. However, the current plan, along with DEQ, is to locate the land application area within the floodplain…the very floodplain that was inundated this spring with flood waters. Current operations at the landfill allow household and commercial solid wastes (only nonhazardous and nonliquid) in double-lined cells with leak detection. However, the older parts of the landfill were operated very differently. There were no liners nor regulatory restrictions on the types of wastes that were disposed of. Consequently, wastes disposed in the old landfill cell included many contaminants that have leaked into groundwater and are contaminating the aquifer. From an overlook point above the valley, we could see the extent of Union Pacific Railroad from the south to north ends of the valley. Right in the center of Pocatello, the UPRR rail yards were visible, where many decades of railroad operations (industrial, mechanical, manufacturing, and repair activities) have occurred. Now, many of the large buildings and facilities have been torn down, even the old roundhouse. But an unseen 150-year legacy has been left behind in the soils and groundwater beneath the site. Contaminants such as petroleum products, chlorinated solvents, mercury and other heavy metals, spills from rail cars, leaking storage tanks, and other spills and leaks have soaked the soils at the rail yard and much of it has contaminated shallow and deep groundwater that flows in a northwesterly direction from the site. DEQ, UPRR, EPA, and several consultants have been characterizing the site and any offsite migration of contaminants. However, the contaminants remain and contaminant migration offsite is poorly understood. The railroad right-of-way was issued when the land was still within the Fort Hall Indian Reservation and could revert back to the Department of Interior on behalf of the Shoshone-Bannock Tribes. Many studies of the Portneuf Valley have concluded that septic effluent from areas in the valley where septic systems are densely located are one of the largest contributors of contamination to the Lower Portneuf Valley Aquifer. In particular, areas such as the Mink Creek drainage, South 5th Avenue, and Johnny Creek subdivision have very large septic density. The Johnny Creek area is also noteworthy for having the oldest septic systems in the valley, coupled with the smallest lot sizes. Over time, these systems deteriorate and fail and there are not replacement options for landowners due to lots size limitations. Many systems have already failed and others will fail in the coming years. Efforts to provide access to municipal sewer lines have not been successful. However, this legacy is a very pressing need for this community. Both cities closely monitor their drinking water systems and react if contaminant levels exceed safe drinking water limits. At this point in time, there are no exceedances of the safe drinking water limits in either city system. However, contaminant levels in the aquifer and in the city drinking water, particularly nitrate, continue to increase with time, nearing the limits for safe drinking water. The TCE contaminant plume from the Bannock County Landfill is poorly understood and has not been remediated or contained, contrary to information provided to the public over the past 12 years. After many years of operating a small groundwater extraction and treatment system at the landfill without oversight and without checking the system to make sure it was doing what it was designed to do, Bannock County and DEQ agreed that the system was not working and that TCE concentrations had not been reduced and that TCE was still leaking out of the old, unlined landfill areas. DEQ is working with the County and a subcontractor to better define the plume and suggest new and improved remedial actions. Much work is left to be done. Information regarding this issue can be found in this FAQ Sheet. For many years, there have been efforts to convince Pocatello, Chubbuck, and Bannock County to work toward protecting the Lower Portneuf Valley Aquifer from contamination. The Idaho Geological Survey’s Dr. John Welhan, Chubbuck Public Works Superintendent Steve Smart, DEQ’s Tom Mullican, Bannock County Planner Steve Ernst, Shannon Ansley (formerly DEQ), and Dr. Glenn Thackray of Idaho State University are a few of the persistent people who have tried to educate leaders to do something. Most recently, PRC has continued to work with Bannock County to enact a groundwater protection ordinance which would be a landmark first step toward protecting drinking water for over 70,000 people. At the end of the day, PRC, IORC, and many friends were treated to a potluck dinner at the home of Tim and Vickie Norton. The specialty of the evening was handmade pizzas, baked in Tim’s outdoor wood-fired oven. It was a lovely close to a great day…old friends, new friends, great food and drink, and beautiful views of the Portneuf Valley. Many thanks to all who participated. Special thanks to the Norton’s, Sue Skinner, and Shannon Ansley. JOIN THE CAMPAIGN TO PUT WATER FIRST! Support our efforts to protect Idaho’s communities HERE.